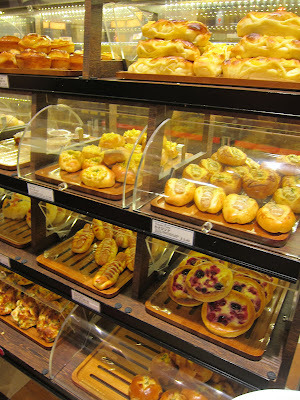 Bakeries are one of my weak spots, and I'd love to go crazy in them but I have my waistline and my wallet to think of :) I was REALLY excited when I found out another famous bakery from Japan is opening in Singapore with a similar background as Maison Kaiser, French-Jap! The store is reallyyyyy small but I sincerely applaud the people who planned the layout of the store as they really made use of every space possible!! Its new for me to see the circle-shaped thing in the middle to showcase the bread, the boards are all curved to fit that thing properly. The types of bread on offer are mostly very unique, flavours and combinations that you dont find in normal bakeries usually, even the "celebrity" ones too which made me really happy and made me want to try out all the breads!!! But alas, I'm the only bread fan in the family and I can't eat that much bread! BUT I'll definitely be going back to try more of their breads 'cos the flavours just beckons me. And it seems as though many people are caught up in this craze of bread too, not just at the newly opened Tiong Bahru Bakery! No matter WHAT time I went, it was always crowded and had a long queue, but like TBB, the queue always moves v quickly! And you'd better go early 'cos they sell out quite fast! 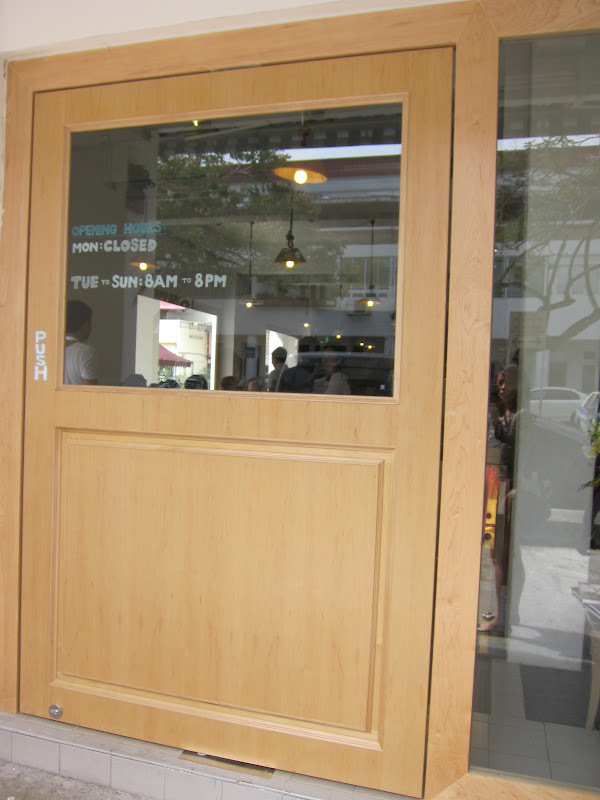 I've heard quite a few customers telling the waitstaff that they came before but the breads were sold out alr. The many types of bread on offer! Thought this was quite interesting! Mentaiko France, its like a baguette but with mentaiko paste on it! Totally a French-Jap inspired bread :) Didnt buy this though so no verdict about it! The boy ate this and here are his comments: 'It was soft, with the right amount of raisins (usually there aren't raisins in cinnamon rolls right - that's me talking btw) in each bite. Cinnamon flavour is only strong at the top of the bun, I would give it 2/5"
My mom gave her verdict on this and said that Tiong Bahru's one was better! Idk if it was 'cos we toasted it the next day but my mom said it was very oily when she picked it up so she didnt like it and she felt that TBB's was more fragrant vs this! They emphasize quite a lot on cheese with MANY of the mouthwatering buns on sale containing cheese. Like the Dutch Bread (looks like a soft pillowy polo bao with a crusty skin), Spinch and Cheese Cookie that was like a thicker version of the usual flat circle ream cheese buns we get (like those from Barcook), and many other breads with cheese. Sweet breads include things like this sinfully rich choc crumble tart lookalike, chocolate boule, chocolate bread that's apparently v good. This restaurant has been around for a long time and has garnered quite a huge following! My family and I were there on a Saturday night and boy was it bustling with people! There were so many regular customers who knew the chefs and the wait staff very well and many expats too. The table turnaround time was so quick! People left, clean up, and its filled again. After a meal at this restaurant, I can understand why. If you're looking for a bustling, relatively wallet friendly, good friendly service, and quite yummy food, then this is definitely the place. But if you want a nice quiet cosy place, this is definitely a no-no, especially on weekends!! Now I'm definitely a fan of this but do yknow how much this costs? $4! And its served to you when you sit down so yes, that's all I have to say. Now this is also served to you once you sit down, one per pax, and guess how much this is? $5! A mushroom, 2 carrots and a small piece of meat. Marinated in Jap wine I think, its slightly on the sweet side. Now this was the result of my Dad and I going to the sushi counter to see what's available. 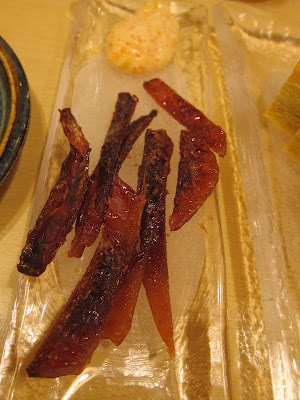 We didnt really like the selection of fish 'cos we've tried 'em before and are quite normal (salmon, swordfish, aji, kinki, etc) so we just ordered toro, think it was chutoro? Then akagai, geoduck, and this other clam which I'm not sure of. Oh and the uni below! I'd say Akashi appeals to people because of the wonderful friendly service, and that most, if not all, speak Chinese there! 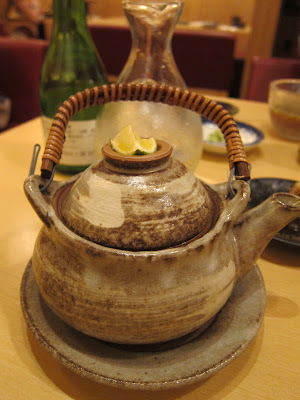 The food is definitely quite good and prices are reasonable as well. Its certainly not a posh, chi-chi Jap place run by Japanese, speaking mainly Jap, so I guess that appeals to the wider audience too? Not sure if the other branches are as good, but apparently, this is the best out of all the other branches! Total spent: $620 something, cant remember the exact price! But do note this is mainly cos of the sashimi which was alr 200 odd! Hello! Went back with my friend to Covelli for her to try their squid ink pasta 'cos they didnt have it during Restaurant Week when we went! I read one review on HGW saying that the squid ink pasta isn't nice but decided to just go ahead and try it, maybe it wont be that bad! But sadly, the standard has dropped quite a lot. I no longer like it anymore!!! Hope Michelangelo's still has theirs down to a pat. This was how it looked THIS time, and the bottom pic shows how it looks like LAST time. Now what's the big difference that makes me so disappointed? 1) Its too diluted now, ok granted its salty, but its just watery-ish and like oily? 2) No seafood infused taste, no mmmm once you slurp the sauce? And next some of the seafood was disappointing. The mussels were too hard, overly cooked or not fresh idk, then scallops were like just a round white thing, no bite to it no nth. The half crayfish/lobster (they say its lobster but I think more like crayfish) was ok prawns were good too. Scattered pieces of squid around. Next, the pasta. This time the pasta wasn't fragrant at all! It was like idk, they put the sauce on top right before serving to us or sth cos really, the pasta was SO bland, I had to eat it w a whole spoonful of sauce (which wasnt tasty in itself) to be able to eat the pasta. What a huge difference from the one I first ate and fell in love with when they first opened :( Guess I'd have to go back to Michelangelo to see if their standard dropped too. Anyhow, Covelli, you won't be seeing me for some time. FYI, I did tell my comments to a waitress (who is v friendly and nice) and did write in the feedback form. They had like about 4 choices of sliced cakes that all sounded really nice and q a wide variety of macaron flavours to choose from! Bought 2 cakes in the end! I gotta apologise for the lack of posts! I went away for a holiday and only came back recently, so :) As I was catching up with the latest food scene happenings in Singapore, I realized that my dear garden city really evolves and changes super quickly! In just 12 days that I've been gone, there are SO many new places that I wanna try!!! Oh gosh, no WONDER my list is never-ending! Here's the entrance! Its just a few doors down from Orange Thimble. Their croissants seemed to be the hot seller 'cos trays and trays and TRAYS of 'em just kept coming outta the kitchen! Well, though my experience there wasn't that great, I won't be striking it off my list yet 'cos since its a BAKERY, I've to try more of their breads to decide! I'll definitely be going back, but on a weekday when their breads are not mostly sold out. The wait staff there are all SUPERDUPERRRRRR friendly and smiley!!! Really! Always smiling, always ready to help and are so friendly! Esp the male cashier and the ppl behind the counters getting your bread for you. Oh and dont worry if the bread/pastry you want it sold out, either wait patiently till it comes outta the kitchen or sth else comes out OR ask the cashier to check if they're baking anymore currently! The replenishment of bread is quite fast so it shld be ok! Singaporeans really do love bread huh, and love the name of a Parisian baker, and the novelty of a new bakery haha it was reallyyy crowded ytd and from what I know, today was v crowded too! Oh yes, they're opened by the Spa Esprit group who also owns 40 Hands, Open Door Policy, House, Tippling Club, Skinny Pizza.... WOW. 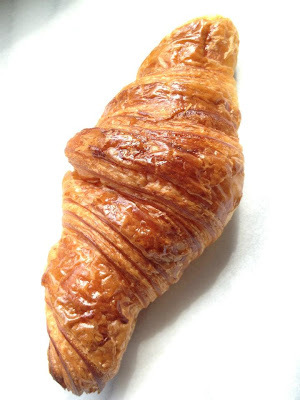 Croissant: My mom says its vvvvv buttery and fragrant! So she loves it 'cos she's an ardent butter fan :) Have yet to ask my Dad abt choc croissant!